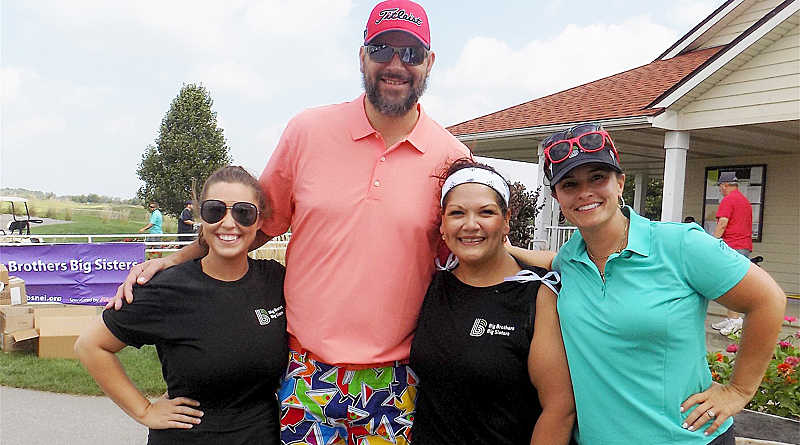 Retired NBA star and former Little Brother, Brad Miller, hosted the 15th Annual Brad Miller Gala, Auction, and Golf Outing to benefit Big Brothers Big Sisters. The three-part event began on Saturday, August 25, 2018 with a Gala and Auction held at the Memorial Coliseum, A Sunday Classic Golf Outing on Sunday August 26, 2018 at Glendarin Hills Golf Club followed by a golf outing at Noble Hawk Golf Links in Kendallville Monday, August 27, 2018. Big Brothers Big Sisters is proud to announce the event raised a record setting $418,000 for the organization and its programs! More than 1000 community members came together to support Big Brothers Big Sisters throughout the 15th Annual Brad Miller Gala, Auction and Golf Outing. With more than 1,000 guests in attendance, the fundraiser kicked off with the Saturday Night Gala & Auction. Featuring 400 silent auction showcases, the live auction included items from Taylor Swift concert tickets, Colts & Pacers trips, a Tin Caps Experience to destination vacations to Mexico, Key West and Disneyworld! The highest selling item of the night was an Exclusive Hunting Trip to Uvalde, Texas with Brad Miller and a special guest appearance on an episode of Country Boys Outdoors – Season 8. The evening ended with a special performance from the Fort Wayne Funk Orchestra and amazing outdoor firework show. The Sunday Classic hosted 20 teams at Glendarin Hills Golf Club. The winning team came in with the best score of 56 and was led by Keith Busse from Steel Dynamics, Inc.
On Monday, the golf outing teed off with 22 teams in the morning and maxed out with 36 teams in the afternoon. At the end of the day, it was the team from Hylant sending in an impressive 51 and best score of the day. In 1985, eight-year-old Brad was matched with Big Brother Dewey in Big Brothers Big Sisters’ mentoring program. Although their official match in the Big Brothers Big Sisters program ended when Brad turned 18 years old, their relationship remains strong as Brad’s basketball career advanced him from Purdue University to the NBA and to Television. Big Brothers Big Sisters would like to give a special thank you to this year’s Presenting Sponsor Indiana Physical Therapy for their continued support and dedication to children in our communities.